One of the ways that Destination BC generates leads for tourism businesses in the province is through promotion of travel deals. The Travel Deals page on HelloBC.com receives over 67,000 views annually. Each month, Destination BC sends a travel deals email to a growing list of North American subscribers. In 2016, these emails generated more than 12,000 leads to tourism businesses across the province. This is a great opportunity for tourism businesses to extend their season and attract new customers by getting their message to travellers already thinking about coming to British Columbia. Destination BC is preparing to launch a fall campaign, so get your business on board now. Include the value proposition in the title and keep it clear, short, and use action-oriented language to create a sense of urgency. Keep the description short and to the point. Describe it in 95 characters or less. That’s 45 characters less than a tweet! Include the direct link (the URL) to your company web page where the complete travel deal details are located. Make it easy for consumers to book – either with an online booking form or a prominently displayed telephone or email address. Pictures really are worth a thousand words. Be sure to include a .jpg format image that supports your deal (and ensure you have permission to use it). Be sure to include an expiry date so the deal will be removed from HelloBC.com. For HelloBC.com, you can have up to four deals running at any time throughout the year. Data from our travel deals emails tells us that 54% of our subscribers are over 55 years old, 55% of them are female, and BC residents are our most engaged subscribers. This information provides the opportunity for some targeted deals. Don’t forget to take advantage of special occasion such as holidays or changes of season to create interesting themed deals. 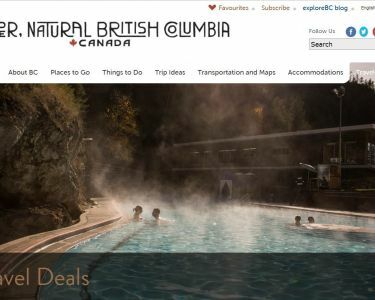 On HelloBC.com, your travel deal will be featured in an ad tile that includes the title, dates, a brief description, and a link to the offer on your website. The deal will appear on your page, on the Travel Deals page, and on the related region or community pages on HelloBC.com. And, every month our team will look for the best offers from across the province to feature in our email or other campaign activities – yours could be one of them! Add or update your travel deals on HelloBC.com today by visiting the registration website. Send any questions to productservices@destinationbc.ca.